(Nanowerk News) To study certain aspects of cells, researchers need the ability to take the innards out, manipulate them, and put them back. Options for this kind of work are limited, but researchers reporting May 10 in Cell Metabolism ("Mitochondrial Transfer by Photothermal Nanoblade Restores Metabolite Profile in Mammalian Cells") describe a "nanoblade" that can slice through a cell's membrane to insert mitochondria. The researchers have previously used this technology to transfer other materials between cells and hope to commercialize the nanoblade for wider use in bioengineering. "As a new tool for cell engineering, to truly engineer cells for health purposes and research, I think this is very unique," says Mike Teitell, a pathologist and bioengineer at the University of California, Los Angeles (UCLA). "We haven't run into anything so far, up to a few microns in size, that we can't deliver." Teitell and Pei-Yu "Eric" Chiou, also a bioengineer at UCLA, first conceived the idea of a nanoblade several years ago to transfer a nucleus from one cell to another. However, they soon delved into the intersection of stem cell biology and energy metabolism, where the technology could be used to manipulate a cell's mitochondria. Studying the effects of mutations in the mitochondrial genome, which can cause debilitating or fatal diseases in humans, is tricky for a number of reasons. "There's a bottleneck in the field for modifying a cell's mitochondrial DNA," says Teitell. "So we are working on a two-step process: edit the mitochondrial genome outside of a cell, and then take those manipulated mitochondria and put them back into the cell. We're still working on the first step, but we've solved that second one quite well." The nanoblade apparatus consists of a microscope, laser, and titanium-coated micropipette to act as the "blade," operated using a joystick controller. When a laser pulse strikes the titanium, the metal heats up, vaporizing the surrounding water layers in the culture media and forming a bubble next to a cell. Within a microsecond, the bubble expands, generating a local force that punctures the cell membrane and creates a passageway several microns long that the "cargo"--in this case, mitochondria--can be pushed through. The cell then rapidly repairs the membrane defect. Teitell, Chiou, and their team used the nanoblade to insert tagged mitochondria from human breast cancer cells and embryonic kidney cells into cells without mitochondrial DNA. When they sequenced the nuclear and mitochondrial DNA afterwards, the researchers saw that the mitochondria had been successfully transferred and replicated by 2% of the cells, with a range of functionality. 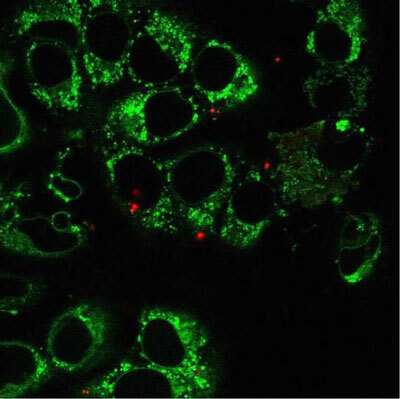 Other methods of mitochondrial transfer are hard to control, and when they have been reported to work, the success rates have been only 0.0001%-0.5% according to the researchers. "The success of the mitochondrial transfer was very encouraging," says Chiou. "The most exciting application for the nanoblade, to me, is in the study of mitochondria and infectious diseases. This technology brings new capabilities to help advance these fields." The team's aspirations also go well beyond mitochondria, and they've already scaled up the nanoblade apparatus into an automated high-throughput version. "We want to make a platform that's easy to use for everyone and allow researchers to devise anything they can think of a few microns or smaller that would be helpful for their research--whether that's inserting antibodies, pathogens, synthetic materials, or something else that we haven't imagined," says Teitell. "It would be very cool to allow people to do something that they can't do right now."